Most of us who have not been in a coma for the past couple years are aware of the water crisis facing the residents of the State of California these days. Multiple years of drought conditions have resulted in historically low levels in water reservoirs throughout California and in lakes along the Colorado River. Farmers are being forced to abandon their crops, particularly in the Central Valley, which has been called "The Bread Basket Of The World" because of the huge amount of crops that are exported annually. On less than 1% of the total farmland in the United States, the Central Valley produces 8% of the nation's agricultural output by value. About one-sixth of the irrigated land in the United States is in the Central Valley. More than 230 crops are grown in that region, including toatoes, almonds, grapes, cotton, apricots and asparagus. 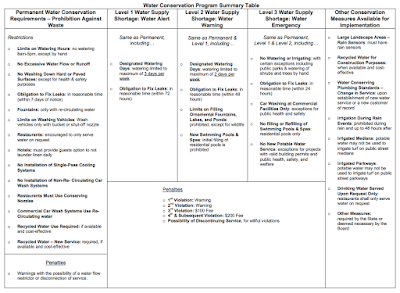 Water authorities throughout the state are mandating conservation measures - driven by edicts coming out of Sacramento. Some may consider those measures draconian, but the simple fact is that we just don't have enough water to conduct "business as usual". We here in Costa Mesa have been insulated from most of the rhetoric because the organization that provides us with water, Mesa Water District, does a very good job of managing that precious resource. We are told that we operate with 100% locally-accessed water from wells that dip into a couple deep aquifers below us, plus Mesa Water is on the leading edge of the technology required to re-use water. The following chart capsulizes the broad brush facts of this ordinance. Click on the image for easier reading if necessary. You will probably wish to go to the actual ordinance and attachments for greater detail on the facts. Little things, like if you're building a home with a swimming pool, you may not be able to fill it under certain conditions. And, penalties COULD include disconnection of your water supply, so wealthy scofflaws cannot escape the need to conserve just because they have a few bucks. By the way, a hat tip to Jordan Graham of the Orange County Register for the article he recently wrote on this issue, HERE. To my knowledge we have not received proper noticing of this extremely important issue at our home, so Graham's piece was the alarm bell for us. I received my official postcard notice in the mail this morning. Not much advance warning, that's for sure. Mesa Water may be drawing from wells, but that doesn't mean it is unaffected by the drought. The wells get water that seeps into the aquifer from rain, so if there is a lack of rain, the aquifers aren't replenished. This can eventually lead to subsidence, as happened in the San Joaquin Valley, where the land has sunken over a period of years. The one day notice pisses me off, but Mesa really had no choice. 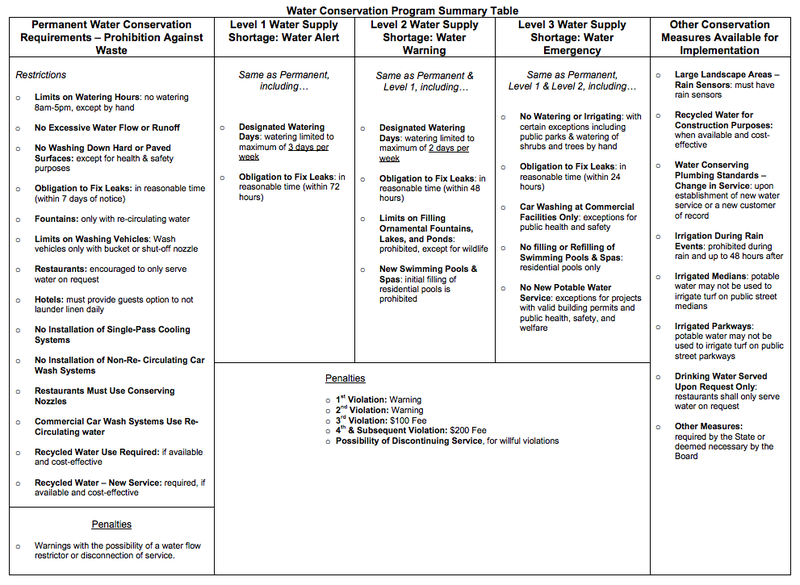 The State Water resources Control just passed additional emergency regulations mandating a 20% reduction beginning June 1, 2015. These regulations were adopted May 5, 2015 and submitted to the Office or Administrative Law May 6, 2015. They may have already been approved, but will be no later than May 16, 2015. There is a big El Niño coming. Did they mention that? I watched today as so much water ran down the streets and gutters. I wonder if its fair or even useful to restrict water for residents, or to impose retrictions, etc. when no attempt whatsoever is being made to capture that much run off? Captured storm run off from urban streets using the existing storm infrastructure was on the MesaWater agenda some years ago on July 23, 2013. 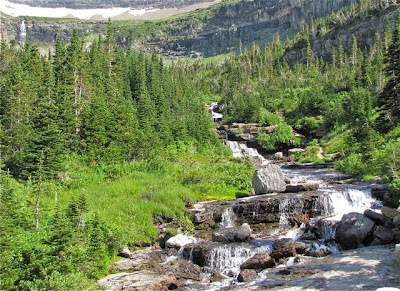 The study by Carollo Engineers indicated that capture of urban run off for irrigation purposes in the area around Lions Park, which was deemed the best candidate hydrologically, would cost more than $15,000 per acre-foot, at the lowest. Costa Meas is about 13 square miles. For a 1/4-inch rain event, that equates to 173 acre-feet, if 100% was captured, which is not possible. MesaWater delivers about 18,000 acre-feet per year. Thus we would need to capture 100% of the rain from 100 such 1/4-inch storms to supply most of the water used. That's 25 inches of rain. At the great cost to capture and treat at scale storm water, it is not cost effective to do so. It's nice to capture rain from your roof in a barrel. If people want to do that, great. Just don't imagine that it compares favorably with the cost of alternatives on the scale required. An acre-foot is 326,000 gallons or 6520 rain barrels at 50 gallons each.